Some days it must feel really good to be Cliffy B. 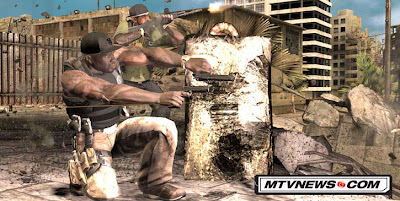 [UPDATE 2/26/08]: New kid on the block-- 50 Cent: Blood on the Sand! Nice homage. As the great playwright Tom Stoppard once said, "If an idea's worth having once, it's worth having twice." But 9 times? Hmm. Not sure what you're trying to say here. That he invented cover systems in games? Or that he popularised it? Either way I wouldn't claim that all of the games you've shown have cover because of Gears of War. You have a video of Rainbow Six Vegas there - that came out within a month of Gears of War. And you're missing a video of Ghost Recon Advanced Warfighter which predates GoW by about a year, if memory serves. Metal Gear Solid 4? Seriously? Everything in that clip is an evolution of the original game. A decade ago. Me thinks you give Cliffy too much credit. Some of this is just natural unrelated progress/evolution. One thing that I did was put an Xbox 360 in an area of the studio where there's a lot of foot traffic, and I also have a PS3 there, and I'll bring in western-developed games. I'll be playing them, or I'll just have it on and running through the intro, to be repeating on the title menu. People will pick it up and play it, and so now we have a lot of Gears fans, and people are playing Bioshock. So people are checking out games that they wouldn't normally check out, and they're getting ideas and inspiration as far as, 'OK, this is how things can work for us; this is what we like.'" Note the cover icons, bottom center of each screen. "Interviewer: Those little icons are reminiscent of Gears of War. RP: Absolutely. I mean, we've played a lot of Gears. Yes, they all have Resident Evil 4-like aiming. What does that have to do with Cliffy B? That is all old news to Sam Fisher. Cliffy is cool. He just didn't invent sticking to a wall. I'm not claiming that Cliffy B "invented" any particular mechanic; what he did was popularize a cohesive character control scheme which is now being lifted, in whole or in part, by other games. This scheme has become a template onto which other games can overlay their own fiction. All of the games noted above lift the Gears scheme either partially or fully. Cliffy may not have invented any single aspect of it, but he created a game which popularized a versatile character control scheme which has been picked up on by developers and publishers the world over. And yes, Rainbow Six Vegas could easily have been influenced by Gears, even though they were released within a month of each other. R6V uses the Unreal 3 engine, which includes the Gears of War source code when licensed by a developer. Even barring that, Ubi could have been looking at preview videos of Gears long before it reached retail. A game doesn't have to be on the shelves yet for someone to draw inspiration from it.